For many spiritual care departments, it is a priority to provide care for patients and families in the ICU. In light of this, the study we discuss in this webinar reports puzzling and distressing findings. Religion/spirituality were mentioned in only 16% of 249 audio-recorded goals of care discussions between healthcare providers and surrogate decisions makers for ICU patients that took place in 13 ICUs across the country. 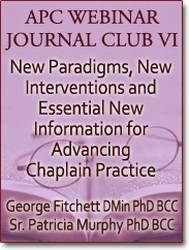 Even more shocking, chaplains were present in only two of the 249 discussions. In this webinar we will review the study findings and discuss their implications for chaplainsÃ¢â‚¬â„¢ work in the ICU. Colleagues from your ICUs may be interested in joining you for this webinar. To introduce chaplains to new evidence that religion/spirituality are omitted from goals of care discussions between healthcare providers and surrogate decision makers for ICU patients. To make chaplains aware of the contrast between this omission and national guidelines for ICU care. Reading: Ernecoff NC, Curlin FA, Buddadhumaruk P and White DB. (2015). Health care professionals' responses to religious or spiritual statements by surrogate decision makers during goals-of-care discussions. JAMA Internal Medicine 175 (10): 1662-1669.